Philadelphia school closed Thursday due to bed bugs; reopens Friday. Katie Katro reports during Action News at 5:30 p.m. on April 11, 2019. PHILADELPHIA (WPVI) -- Some students in Philadelphia have the day off on Thursday after bed bugs were found in their school. 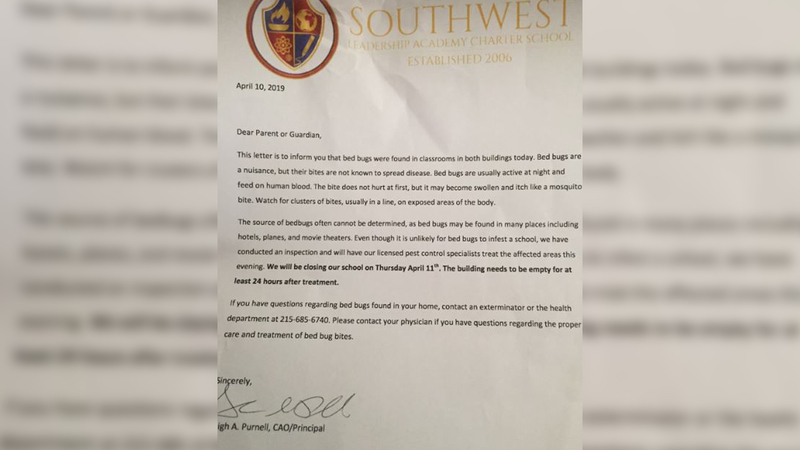 School officials at the Southwest Leadership Academy located on the 7100 block of Paschall Avenue sent letters home to parents saying the school will need to be closed for 24 hours to get rid of bed bugs. The bed bugs were found in classrooms. Some parents outside the school Thursday said they were concerned that bed bugs were found inside the school; however, they were checking their kids at home to see if they had any bed bug bites. "Oh my gosh, I'm so concerned. I'm freaking out," said parent. Marcie Davis. "How a person doesn't know they got bed bugs at home? That's scary." The crossing guard stood at the corner outside of the school Thursday with no kids to help cross, as the school zone lights flashed. Both of the school's buildings were closed today while pest Control specialists work to exterminate the affected areas. Some still showed up thinking there was school today. "They are closed today? What happened?" asked Farmatta, the aunt of a student at the school. Philadelphia charter school closed Thursday due to bed bugs, officials say. Brian Taff has more on Action News at 10 p.m. on April 10, 2019. The letter that was sent home Wednesday encouraged parents to check for bed bug bites on their children. The school said the bugs are usually active at night. The bites will swell and itch like a mosquito bite. The letter said: "Watch for clusters of bites, usually in a line, on exposed areas of the body." It encouraged parents to contact the health department if bed bugs are discovered inside their home. Parents with questions can contact 215-685-6740. The school is expected to reopen on Friday.